Lawn spreaders are a nutrient and fertiliser broadcasting device that ensures that the correct amount of product is used. A calibrated lawn spreader means your garden gets the right amount of nourishment or seed without waste. 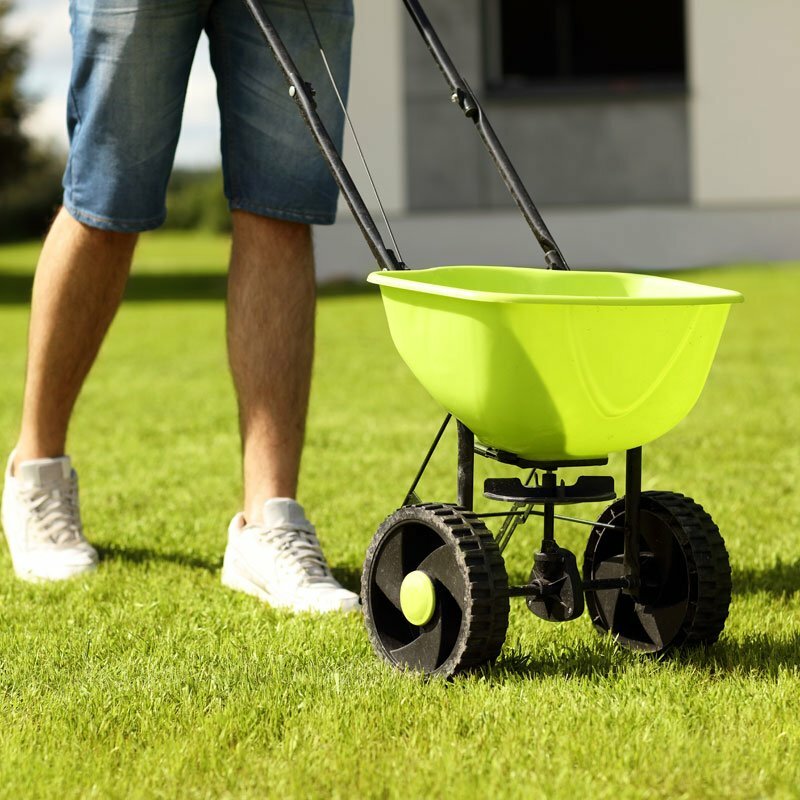 In larger gardens, the time and cost savings provided with a high-quality lawn spreader make them an essential purchase. As the name suggests, a handheld spreader is carried by the users and is usually only for the broadcasting of seeds and typically not used for fertiliser. The device consists of a hopper which holds, typically, 1 to 2 kilos of seed and a handle to the side of the device which, when turned releases seed. The amount of product released at each turn is usually controllable by varying either the bore of the chute which releases the seed or the number of times the hopper is opened during each rotation of the handle. Most uses of hand-held lawn and seed spreaders develop a rhythm and pace of walking and turning which ensures a good, even and cost-effective spread. The rotary lawn spreader spins and throws the feed in an arc allowing for a large area of lawn to be seeded at one time. This is perfect for those of you who have a large area to cover. Unfortunately, it’s drawback would be that it is not as accurate as the drop lawn spreader. However, if you want the job done quickly this is the perfect tool for you. We would advise against using this with weed and feed products. Drop lawn spreaders are incredibly accurate, giving you even distribution of feed throughout your lawn. The top of the range drop lawn spreaders will come with a control mechanism, allowing you to shut the spreader off. As you are walking up and down your lawn you will quickly notice the feed drop out between the wheels of the spreader. This will help you to line up the lawn spreader with the previous row. Garden spreaders are used for two purposes. Seed broadcasting and the equal application of fertiliser. There are more or less sophisticated ways of ensuring a good even and appropriate coverage of seed or fertiliser using a spreader. The most simple system relies on the user keeping a steady pace and controlling the broadcast of seed or fertiliser with a simple open or close toggle on the hopper the product is stored in. Keeping a steady walking pace and setting the bore width for the feeder is all that is required to get a fairly accurate spread of seed or fertiliser. In recent years more elaborate upright devices have a geared mechanism that is attached to the wheel and uses the rotation of the wheels as a guide to how often the product is broadcast. Typically every full, half or quarter turn. The mechanism opens the hopper to drop one unit of seed or fertiliser at every calibrated event.